My name is Alfredo Sánchez Tójar and, as the latest PhD student to join the Lundy House sparrow Team, I’d like to share with you the wonderful experience of my first visit to that beautiful and remote island. The trip started the 6th of November, exactly two days before arriving to Lundy, at the West Titchberry Farm (Hartland). There, and thanks to Yvonne’s hospitality, Isabel Winney and I could spent one entire day, the 7th, catching the house sparrows that live in and around the farm. We managed to catch 3 females; one had been previously ringed by Isabel about 1 year and 9 months before. These catching attempts have been carried out since November 2011 to DNA sample the closest house sparrow population on the mainland. We already have much evidence suggesting that house sparrow migration from and to the island is very low and those samples will help us in getting more insight about these processes. Charlotte Morgan joined the expedition on time to get the helicopter that would bring us to Lundy where we arrived with enough time to prepare everything we would need for starting catching on Saturday, the 9th. We wouldn't stop catching until the 14th of November, but we welcomed the last member of the expedition, Mirre Simons, on the 11th. We spent all the possible time catching, even during the last hours of the night, just before dawn, when we managed to catch some of the birds that sleep in nest boxes during the winter. Thanks to our enthusiasm, we managed to catch a total of 134 individuals; only 8 of them (i.e. < 6%) had escaped the summer's effort and needed to get their individual set of colour rings, BTO metal ring and PIT tag. House sparrows chicken feeder photo: House sparrows socializing at one of their favorite places, a chicken feeder. During our stay, I also carried out my first trials to record dominance hierarchies and social interactions between individuals. 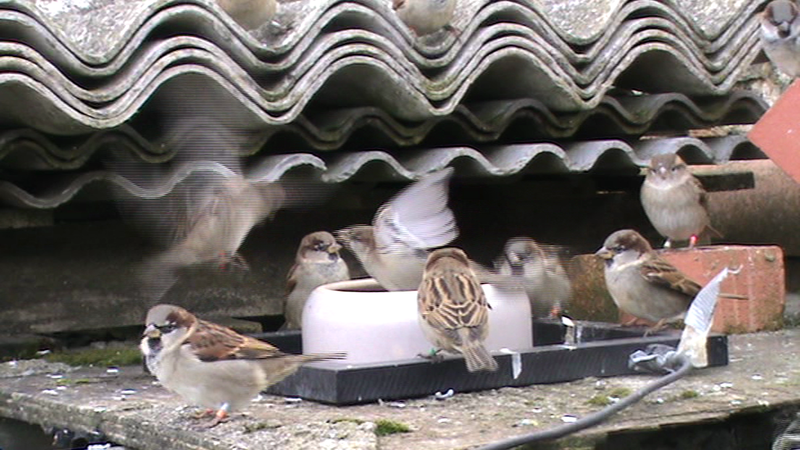 I set up several feeders around the island and videotaped sparrows. It took several days until they started to visit some of the feeders but I could finally manage to get 3-days data from two of the feeders. I've already started to analyze these videos and they are very promising. Happy with our great success, we left the island the 15th of November. However, time goes fast and we are already planning our next visit to this wonderful island. And yes, don't worry, we'll also share with you our experiences from that trip. See you soon. Fig. 4: More social interactions. 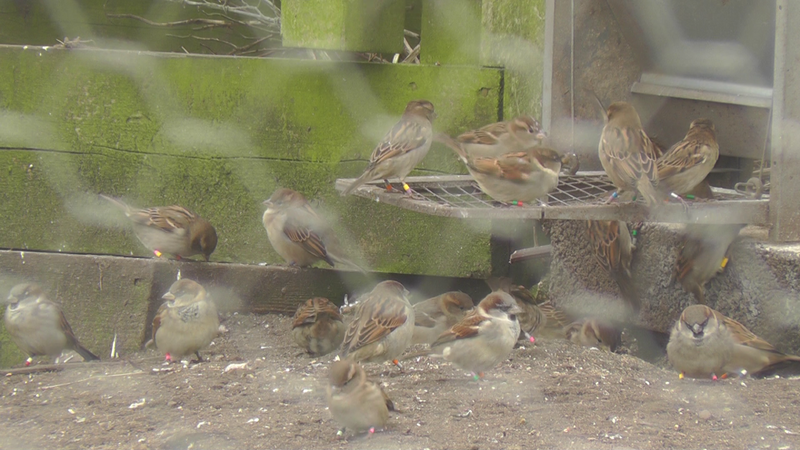 Note how all sparrows are ringed! Acknowledgements: Thanks to the people on Lundy for their hospitality and help, to Yvonne for her friendliness and to all the members of this successful expedition.